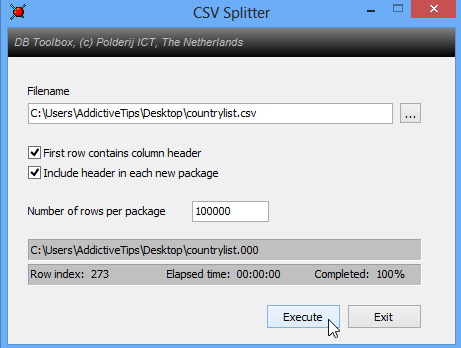 What Is the Best Way to View or Edit Large CSV Files? Our clients have been frequency asking us for recommendations in opening large CSV files and easily split it into smaller parts while retaining column headers. Reviewing massive amounts of data is tedious work, especially when you’re stuck with repetitive, tabular data, like mile-long domain names, represented in a CSV file. Anyway, you can easily split those long lists into as many segments as you like. Here are some tools and solutions you can use working on it. How can I open large CSV file on Mac OS X? How can I open large CSV file on Windows 8 Pro, Windows 7, Vista & XP? Enter the number of rows you want each file to have or calculate a value depending upon the number of resulting files you wish and hit “Execute” when you’ve entered the required value. To get started, click the browse button to the right of the “Filename” field, and select the CSV file you want to split into smaller ones.